Tylose powder CMC - (Carboxyl Methyl Cellulose) FOOD GRADE QUALITY. is used in some gumpaste recipes but you can add it to plain fondant to create a quick version of Gumpaste for creating figurines and sugar flowers. 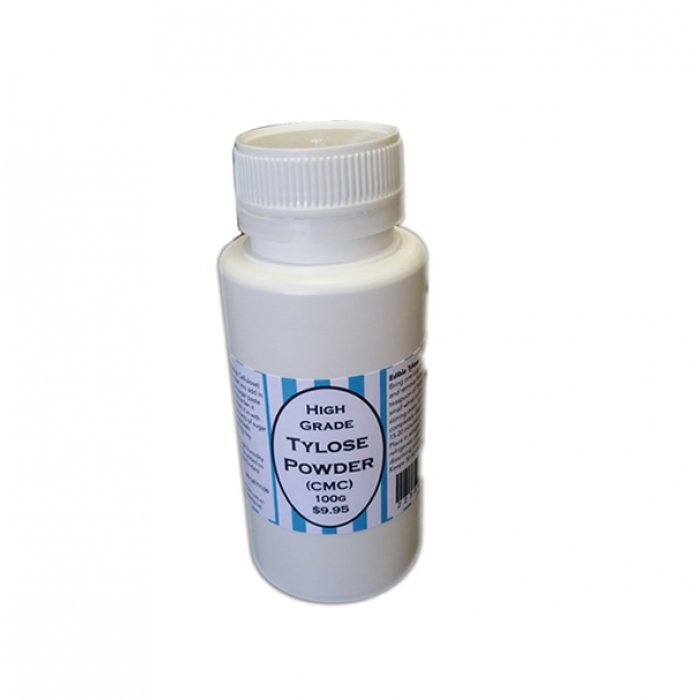 Tylose powder is a fine powder you can work into fondant to make a really quick transition to gumpaste. To create a quick gumpaste with fondant just Add 1 -2 tsp of Tylose powder to 1lb of fondant. Dry humidity areas use less Tylose – High humidity areas use more Tylose. Knead it in very well to your fondant. If you are using a pre-made Gum paste you don’t need to add any Gums to your paste because it already has some form of Gums in it. If you do not use a pound of fondant at a time when creating models use small pinches of tylose powder to fondant until you get the required consisitency that suits your job. Once the tylose is added you do need to work with some speed to avoid it setting before you have created your piece.